Education - Medicine: Maha-Kumba-Abishekam or Medschool? Having got the acceptance letter from medical school, my life has certainly been busy. I have been preoccupied planning the forthcoming trip to go to medical school, such as booking my flight, purchasing medical textbooks, etc. I wanted to know when I should book my flight as school would be starting September 1st, 2002. I need to arrive at least a week prior so that I can adjust to the new atmosphere. That would be approximately late August around the week of the 22nd. In planning to leave on this day I was also aware that the local Murugan temple in my community (that I frequently visit on Tuesdays and Fridays) was scheduled to have a Maha-Kumbabishekam for August 22, 2002 on powrnami (full-moon) day. I really would like to attend this special occassion as I have never witnessed a Maha-Kumbabishekam before in this life. But at the same time, I wanted to leave on full-moon day as it is highly recommended by the wise to undertake new ventures, such my commencement of a medical career, on auscipicous days. However, after last night's dream I may have to delay my trip on God's will. The main priest made numerous requests for items such as fruits, water, etc. that he needed to perform certain rites to invoke the Gods. So I frequently found myself swiftly walking back and forth fulfilling the priest's requests. Then the priest carried with him a kumbam filled with energized water created by the vibrations of the vedic chanting and yagnas. He went over to a Ganesha vigraham and poured the sacred water on the statue. I prayed in my heart, as the priest did this, asking for God's blessings. Then the priest went over to the next vigraham to consecrate it with the sacred water. The crowd, too, followed but for some reason I didn't. The reason being, as I was following the main priest something caught my attention. It was a Murugan vigraham. It was greyish in colour. I remember seeing his right hand in the Abayahara pose signifying, "Fear-not, I am here." and the left hand extended down showing that the way to approach Him is through His feet. Bhagavan Sri Skanda also had a myol standing behind Him on the side of His right foot. I also recall seeing the Vel resting on His right shoulder. As my gaze was afixed on Murugan, I did not know what the other vigrahas were that the priest poured the water over. In fact, I completely forgot about the priest, the consecration of the other vigrahas, and the temple devotees. My feet were locked as I absorbed myself completely in admiring Sri Skanda's beautiful form and asking Him within myself for His blessings. Upon thinking this thought, the priest immediately called me over and asked me to stretch out my hand. He sprinkled a small quantity of something in my hands. When I looked in my hands to my surprise was a mountain of vibhuthi filling both my palms. The quantity was equivalent to that of a small ant hill. I immediately grabbed handful quantities of vibhuthi and started smearing it all over my body. In fact, if anyone saw me they would have thought I was a ghost because my body was that white! I have always held an internal belief that the true blessings from God is not through prasadam (blessed food), theerthum, or even flowers. 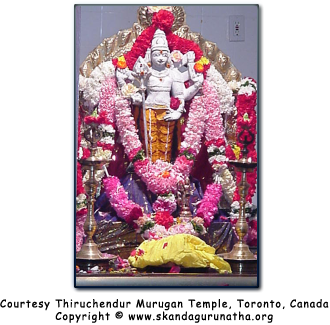 It is through the sacred vibhuthi that God gives His blessings. And that is exactly what God did by hearing my heart-felt request for His blessings. Then what happened was the priest started to do the puja. Before he started He came over to me and said,"Here, hold this." When I looked in my hands it was a brightly shining gold-statue of Ganesha! He was sparkling. He looked so beautiful [resembles the form in our prayer room  the hologram]. It was then that I was abruptly awaked by my father. My alarm clock failed to go off, or perhaps it did but I certainly did not wake up to it. My father said,"[my name], get up! It's 5:30am. You're going to be late for work." I immediately got up and took a bath, did my morning prayers, ate breakfast, got dressed, and left for work. I was happy for both Sri Ganesha's and Sri Skanda's blessings to me last night but sad because I was awakened. 1. The upcoming kumbabishekam for the Murugan temple on August 22, 2002 is not to be missed. It is God's will that I be present for He will graciously extend His blessings on that day before I embark on my long journey and career in medicine. 2. As a result of this, I would undoubtebly have to reschedule my flight for some date after the 22nd of August. 3. God really does bless through people (such as priests) who wear the sacred marks of vibhuthi all over their body. Hence, I must always respect and prostrate to such people. My dear and loving brothers, Sri Ganesha and Sri Skanda. You two always work together just like when you graciously gave that sacred thread and japa malai for me a year ago [see below]! From the very depths of my heart do I offer my humble pranams to both of your lovely divine lotus feet. Thank you for your blessings before I leave for medical school! Here is a picture of the Lord Murugan murthi that was consecrated at the mahakumbha-abishekam (notice it is covered with vibhuthi?) - just like the dream I had.